Troop 20566 and adult leaders gather on the Mound in Oudolf Meadow Garden, with their DBG hosts. On June 18, Girl Scouts from Troop 20566 in York, Pa., created a new garden project at the Delaware Botanic Gardens (DBG) in Dagsboro. The 15 Girl Scouts and nine adults had worked on preparing the project for months. 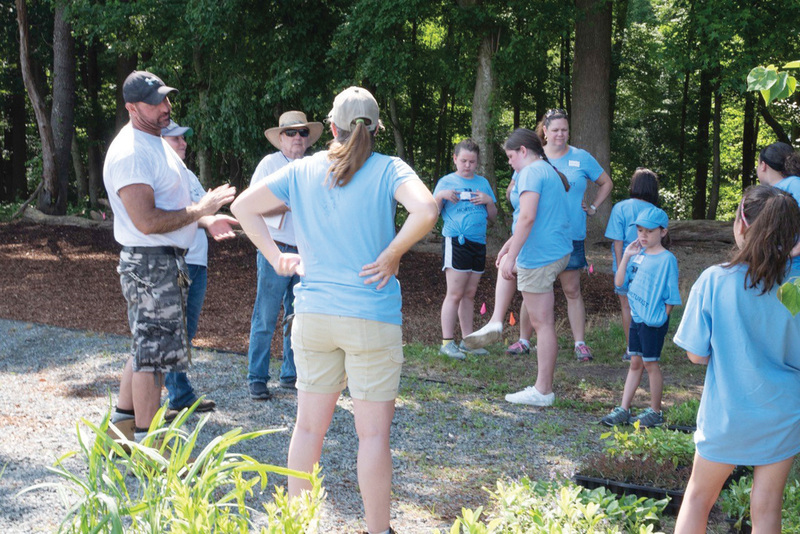 They selected 500 plants and four redbud trees, which they planted on one very hot day. Troop 20566 is part of the Echo Valley Community of Girl Scouts Heart of Pennsylvania. They meet in eastern York County, and the Girl Scouts attend Eastern York School District and Central York School District. Co-Troop leader Marie Moore also explained that they are an unusual group because Troop 20566 is composed of mixed age groups, including Brownies (grades 3 and 4), Juniors (grades 4 and 5) and Cadets (grades 6, 7 and 8). “We all stay together and learn together,” Marie said. The mission of the Delaware Botanic Gardens is to create an inspirational, educational and sustainable public garden in Delaware for the benefit and enjoyment of all. The Delaware Botanic Gardens celebrates the coastal plain with a sustainable garden that delights and educates visitors and inspires them to preserve Delmarva’s native landscape.